You are here: Home / Wild Blog / Wildlife Resources / What’s that Bumblebee? We have 20 species of bumblebee in Ireland — 14 true bumblebees and 6 cuckoo bumblebees. It’s great to see their rotund furry forms bustling around the garden again with the onset of spring… but for the wildlife enthusiast they present a bit of a conundrum. Several of the most common species of bumblebee look very much alike, making it really difficult to know what you’re looking at in the field… or in the garden. If you’re like me not being able to positively identify something will drive you nuts. You’ll fret, you’ll rack your brains, you’ll work Google to within an inch of its life… you may even lose sleep. Fret not though bumblebee fans… the UK Natural History Museum website (which is fantastic for lots of wildlife related things) will save you sleepless nights by helping you to ID that bee using their interactive online bumblebee dentification guide. 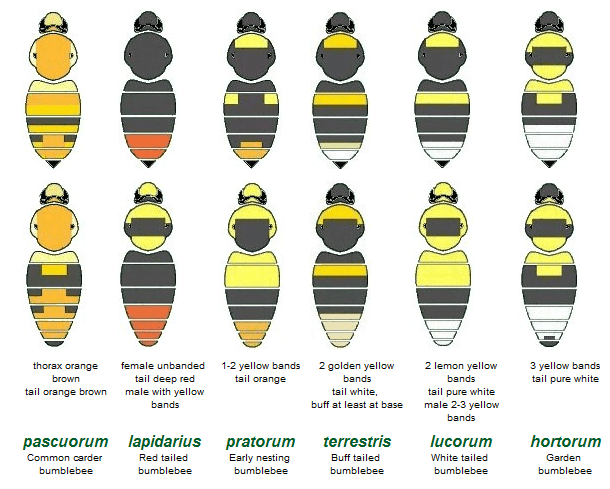 There’s a HTML version and a Flash version: simply choose which you prefer, enter your bee’s features and the tool will spit out a selection of possible species – choose the one that looks most like your bumblebee and you have your ID. Simple! There’s also a handy “Quick Guide” to the top 6 species of bumblebee found in the UK and Ireland, complete with downloadable PDF wallet-guide for your to print out – which is really handy when you find yourself in the field (or garden) without a field guide or internet access.